Ok...so I have a monster cold. You know the one? The one where it feels like someone has pumped a concrete slurry into your head? You can't hear. You can't breathe. Your eyes are dry. Your head pounds. Your throat is raw. Your nose is dripping like a tap. Fun times all round. NOT! Not to be out-done by this minor health setback...I got up this morning and decided to make a card. But do you reckon I could think my way past my box of tissues and Panadol? NO I COULD NOT. So I went and found a challenge to help me on my pox-ridden way. NOW...while I'm not 100% impressed with my end product, in my current state I can hardly afford to be picky. I am lucky I managed to remain conscious the entire time (am I a drama queen or what?) any one would think I had a MAN-cold (on this subject...check out this You Tube vid...hysterical!). Accessories: Chiyogami paper, Cherished Memories Rub-Ons (SU - retired), Wireworks Gold Wire (SU - retired), Carl Craft small butterfly punch, Black Satin ribbon (PTI), Mini Glue Dots, Sticky Strip, SNAIL adhesive and Dimensionals. Now I think I might need to go rest a while. Hope no one else has a welcome-to-spring cold. It's pretty sucky methinks! (Blogged to: Word Up - Cameo and Barbra Streisand - Duck Sauce). GO YOU!!! This is beautiful Sam! You did brilliantly considering your not in the best of health at the mo! Hope you get better soon my friend! There is nothing worse than a gross heavy head cold. Thankfully I haven't had one in a lonnnnnnnnnng time! Sorry to hear you're not well! Your card for JAI is super cute. Thanks for playing. 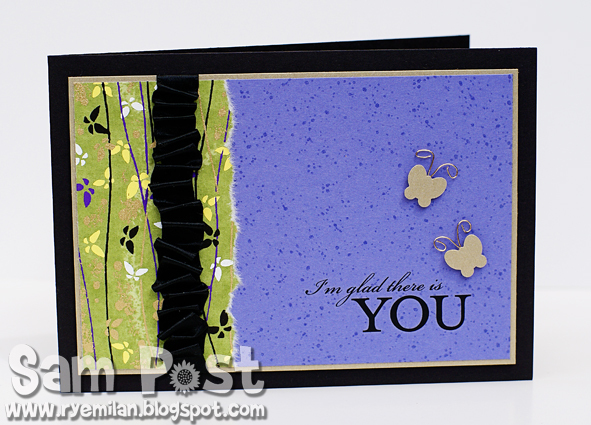 LOVE the colours, the Itty Bitty Background stamp, and the itty bitty butterflies! Your card is gorgeous, Sam. Hope you get better soon. love the colours, they are really vibrant against the black! 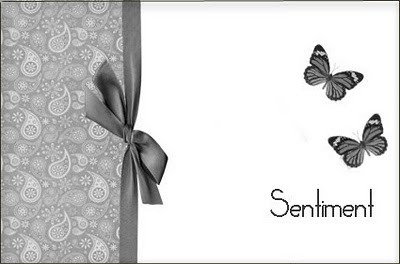 And those butterflies are just so cute :) I'm sending lots of feel better soon wishes your way too. Oh Sam - soooo sorry to hear you're unwell - I hope you're feeling better SOOOOON! 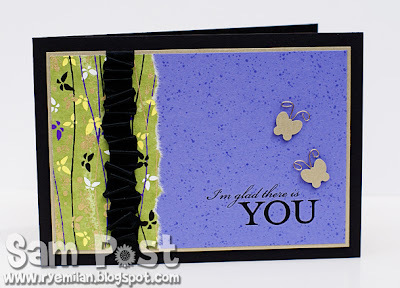 But I love this card - the colours just make the simple layout POP - and that ribbon is delicious! Take care and I aim to be around more now my trip is over, so hope to hear you're feeling better! A really lovely card. Nice Job! This is lovely Sam. Love your colour combo, that PP is gorgeous. Hope you're feeling better. I always love reading what you're blogging to. Gotta love a bit of Cameo and that red cod piece, lol!